Me VS. The Sugar...: The Burritos Strike Again! I got up later than I wanted too, again, and wasn't out of the house until 6:35. Boooo!!! I made a strawberry smoothie for my pre-workout snack, oh so strawberriciously yummy! 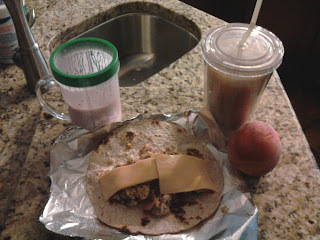 I also made the infamous breakfast burritos for me and my hubby, with eggs, ham, cheese and spinach on a whole-wheat tortilla. It took me a while to get used to these tortillas, but I found a brand I really like. I'll post the picture later. The peach & the coffee were really good too. Ahh, coffee - my bestest friend in the mornings! I have no idea why I can't get up in the morning! Ok, well I do, it's because I'm tired and I refuse to go to bed earlier than 11pm. I mean, I know that by the time I wind down, I probably don't go to sleep until 11:20-11:30 at the best. Then that means less than 7 hours of total sleep. Arghhhh, at myself! I still made it to the gym, though. I had enough time for a 5 minute workout and 30 minute weight session. I can feel people looking at the baby belly, and probably thinking, "What is she doing?" I just power through though, I know it's good for me and for the baby. Plus, I'm not lifting any heavy weights, I make sure to stay hydrated and I try to really listen to my body.